Sunday will start mostly sunny though there will be afternoon clouds and showers in the northern mountains. Monday and Tuesday will be dry and warm across Colorado. The next storm is still on track to bring snow from Tuesday night through Thursday evening with 12+ inches possible in the northern mountains and the softest and deepest powder likely on Thursday morning. After that, our next chances for snow will be April 21-23 and again around April 26. Loveland Ski Area is serving up spectacular spring skiing through Sunday, May 5 and you can enjoy every last minute of it for free! 2019/20 season passes are on sale now and provide unlimited access to the snowiest ski area in the Front Range, bonus days at over 30 partner mountains, plus FREE skiing and snowboarding for the rest of this season. BUY NOW! I received two recent reader pictures with contrasting subjects. 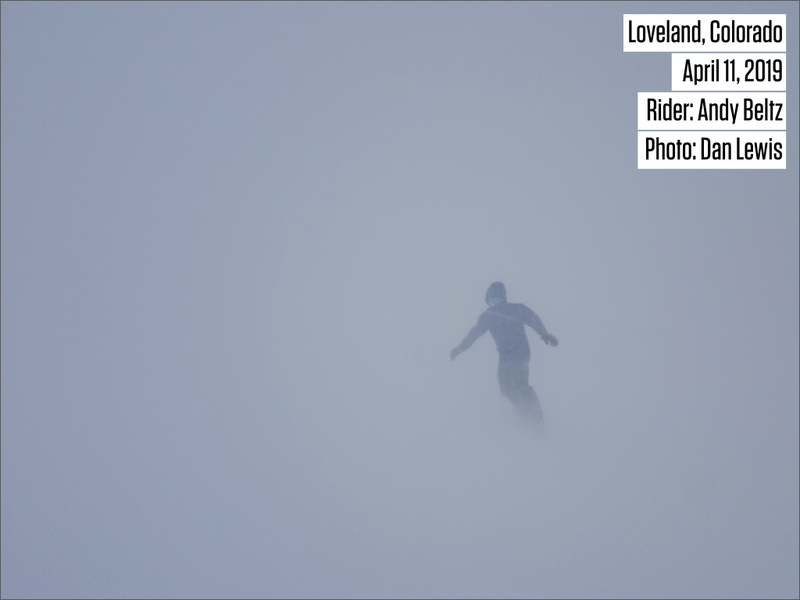 The first picture is from Thursday’s powder day at Loveland. Rider in the storm! The second picture is from Saturday afternoon at Eldora where it was Pond Skim time! 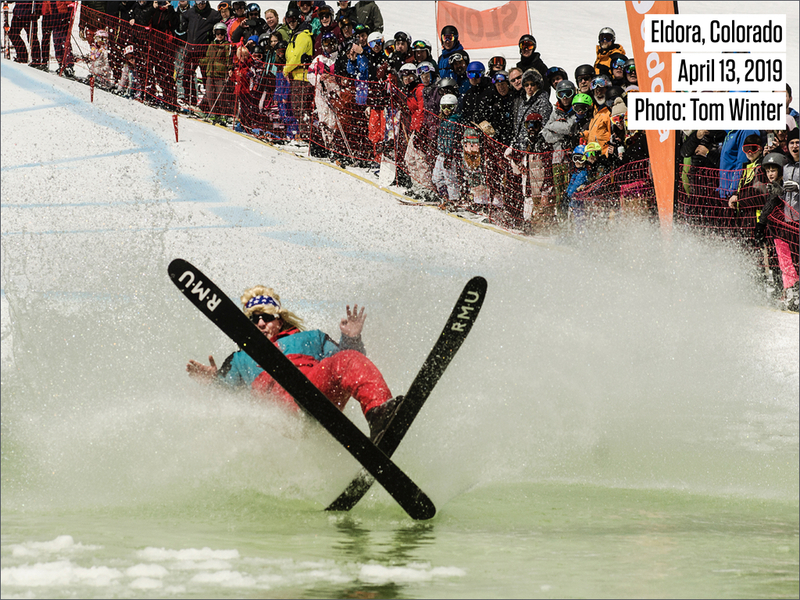 Pond Skim is usually held on the final weekend of the season, but Eldora has extended their hours and will be open through Sunday, April 21st. The weather yesterday, Saturday, was a mix of sunshine, clouds, and snow showers. 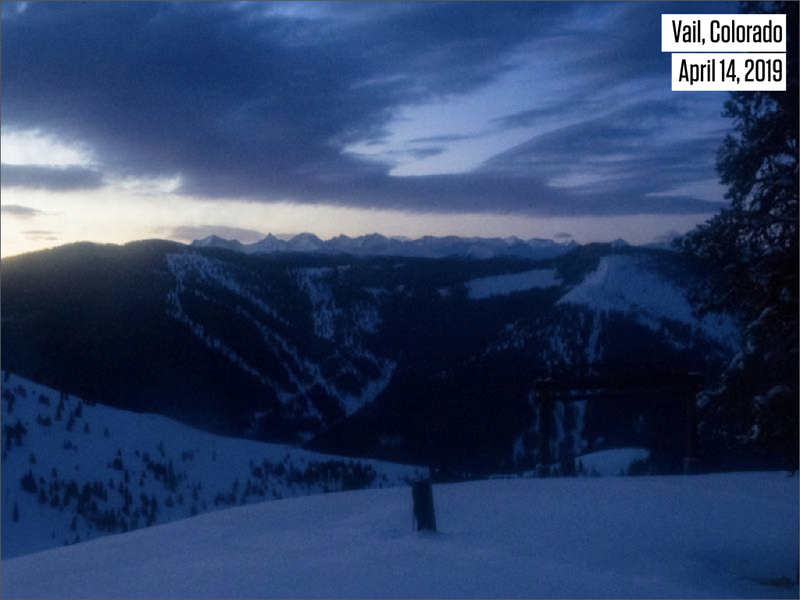 Most mountains reported 1-2 inches of accumulation through the day. 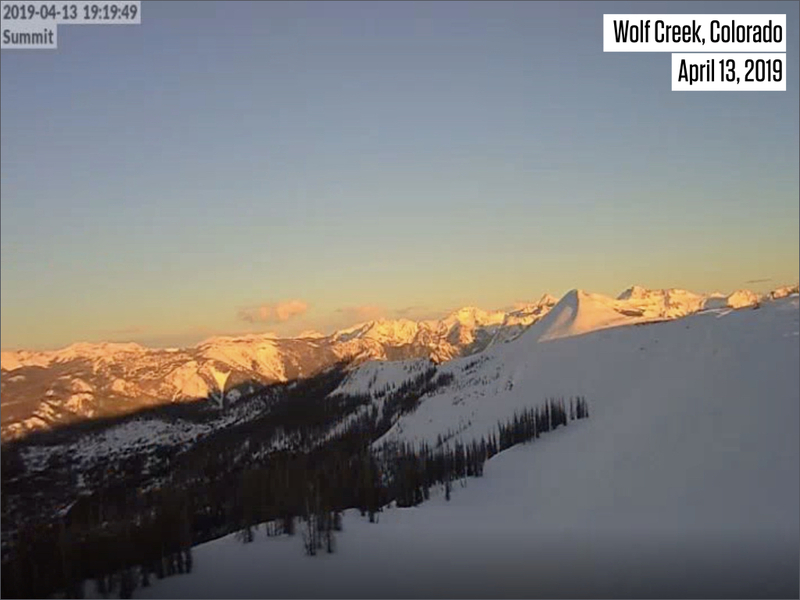 Clouds and showers cleared by late Saturday afternoon, providing this beautiful sunset at Wolf Creek with the day’s last light illuminating the peaks to the south of the mountain. Now on Sunday, we’ll have one more mixed day. The morning will start dry with a few mid-and-high-level clouds floating around. During Sunday afternoon, the northern mountains will see clouds, showers, and maybe a coating to 2 inches of snow as moisture and energy clip the northern half of Colorado. Looking ahead to Monday and Tuesday, we’ll see mostly sunny skies and dry weather. High temperatures on both days will be in the 40s, so it’ll feel like springtime with firm snow in the morning and soft/mushy snow in the afternoon. The next storm from Tuesday night through Thursday evening is still on track. Models are waffling a bit on the storm's exact track, strength, and snow amounts, though the general concept of ‘snow’ for two days hasn’t changed. The first wave of snow will fall on Tuesday night and Wednesday with 4-8+ inches. Temperatures will be cold enough for snow, but not that cold, so the snow should be thicker and denser. The second wave of snow will fall on Wednesday night through Thursday afternoon with 4-8+ additional inches, mostly for the northern mountains. Temperatures will be colder by Thursday, so the snow could be somewhat fluffier. My eye is still on Thursday morning as the time that will offer the deepest and softest powder in the northern mountains. This expectation relies on enough snow falling on Wednesday to start softening the base, with the snow on Wednesday night and Thursday providing the fluff on top. If Wednesday’s snow doesn’t come in as expected, or the showers miss certain mountains, then Thursday morning won’t be as good as we are hoping. 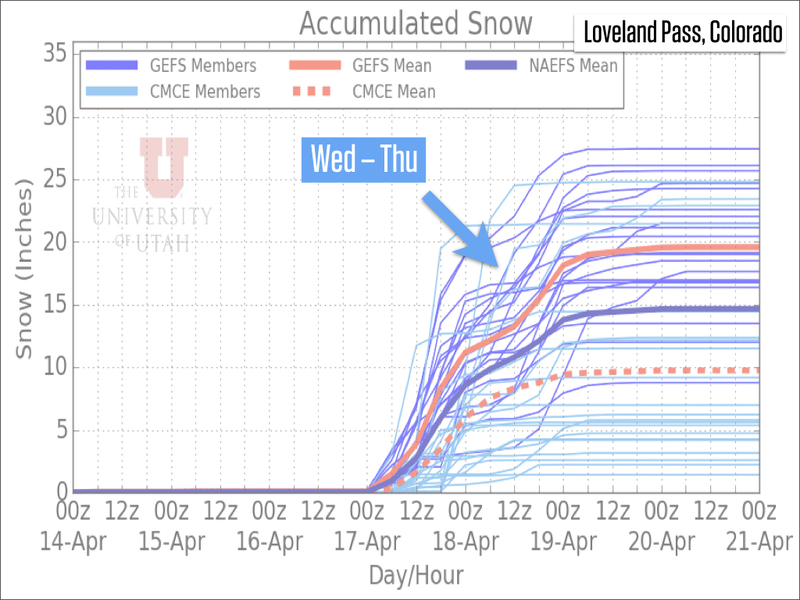 The University of Utah multi-model forecast still shows the potential for healthy snow totals in the northern mountains with upwards of 12 inches. Friday and Saturday (April 19-20) should be warm and dry. It’s possible that there is soft snow on Friday morning, leftover from the snow on Thursday and Thursday evening, but Friday looks completely sunny, so the sun will turn any early-morning fluff into mid-morning mush pretty quickly. The next chances for snow will be around April 21-23 and likely again around or just after April 26. For resorts that are still open, we should have a few powder days extending late into April. Bluebird Backcountry – another event!